Over/Under: Over 181.5 at 1.90 Bet Now! While the appearance of the United States in the Olympic Men’s Final in Rio isn’t a shock, some people will raise an eyebrow at the presence of Serbia. However, there is no denying that Serbia have been hugely consistent on the international stage of late and we are in for a grand final in Brazil this Sunday. With the Serbian Women taking Bronze in the Women’s basketball tournament, and Serbia Men taking at least the Silver, this has been a huge tournament for Serbian basketball. Of course, the USA Women have another Gold Medal and the USA Men will be looking to join them. You fully expect USA to come out and put on a show in the final but equally, Serbia aren’t going to roll over and let the USA take the Gold Medal. As was shown in the USA’s semi-final against Spain, they can’t just run away with game at this stage of the tournament unless their opponents collapse and the USA really push for success. 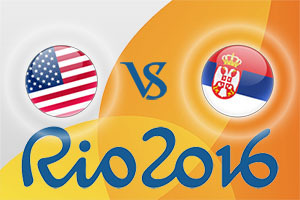 The Americans have the players but Serbia have a great team spirit, which could allow them to push the Americans all the way. With that in mind, look to back Serbia at +15.5, which you will find available at odds of 1.90. Anyone looking to get involved with the Over/Under market should look to go OVER 181.5, and this is provided at odds of 1.90. Bet Now! There is a Race to 20 Points market available for this game and the United States can be backed at odds of 1.25. The USA at half-time and USA at full-time double result is available at odds of 1.25. For the best value in the Olympics Final, it may be best to look at the margin of victory. If you expect the USA to win by a margin of 7-9 points, back them at odds of 8.00. For a US margin of victory by a gap of 10-13 points, the odds are available at 6.00. You can back a Serbia win by 1 or 2 points at odds of 36.00 or you can take Serbia to win by 3 or 4 points at odds of 26.00. The game starts at 1945 BST on Sunday 21st of August.